The Millennium Challenge Account Jordan (MCA-Jordan), a company owned by the Government of Jordan to manage and implement a $275 million grant program funded by the U.S. Government’s Millennium Challenge Corporation (MCC), held an official ceremony on Thursday to mark the successful completion of the grant program, which included projects to upgrade and expand the water and wastewater networks in Zarqa Governorate, as well as the expansion of As-Samra Wastewater Treatment Plant (WWTP). The ceremony was held under the patronage of H.E. Minister of Water and Irrigation Dr. Hazim El- Nasser and U.S. Ambassador to Jordan Alice G. Wells. Among the attendees was MCC Regional Deputy Vice President, Europe, Asia, Pacific and Latin America Fatema Z. Sumar as well as other representatives of MCC, the Government of Jordan, donor community, private sector, community-based organizations, and local community. increased the water demand in the country by 22%. 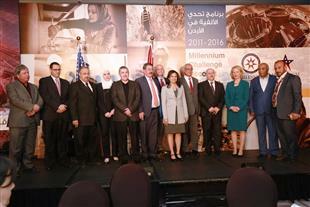 “For over 60 years, the U.S. Government has partnered with Jordan to make strategic and critical investments in the nation’s water sector," Wells said at the event. "Jordan’s successful implementation of the $275 MCC-Jordan Compact from 2011 to 2016 has transformed the water and sanitation infrastructure in Zarqa.” The U.S Ambassador added. “Our partnership with Jordan has touched the lives of millions of people thanks to the hard work and dedication of our Jordanian partners,” MCC Regional Deputy Vice President said. “With improved access to clean water, citizens, businesses and the Government of Jordan are now well-positioned to build on this progress to improve lives and create new opportunities for years to come.” Sumar added in a speech during the event. In the five-year grant program (2011-2016), MCC financed the implementation of three main projects in Zarqa Governorate. The first project was the Water Network Project, laying out more than 800 km of pipes alongside the replacement of more than 40,000 water meters. This also included a new water pumping station and reservoir at the Basateen area in Russeifa city. The water network project are to help reduce water losses and increase the water supply hours to the citizens and businesses of Zarqa Governorate. The second project was the Wastewater Network Project of over 300 km of wastewater pipes to reduce water flooding onto the Governorate’s streets and increase the areas that are linked to the sewage system. The third project was the expansion of As-Samra WTTP, which was completed on October 19, 2015. The project increased the capacity to handle more wastewater, treating 70 percent of sewage water in Jordan and providing up to 133 million cubic meters annually of reusable treated wastewater for agricultural use, freeing up fresh water for households and businesses. The project also helped enhance the ecosystem of Zarqa’s river and the surrounding area. In addition to the three projects, MCA-Jordan implemented the Water Smart Homes Activity, which included the awareness campaign “By Water We Live – We Preserve it to Survive”. The campaign helped increase awareness among the residents of Zarqa Governorate about the best practices of water management inside their homes, successfully reaching more than 14,000 of the poorest women in Jordan and tens of thousands more. Water and wastewater infrastructure was also repaired and upgraded in around 4,000 of the Governorate’s most deprived households. Furthermore, the project included training 30 women on plumbing, empowering them to generate income. In his speech, MCA-Jordan CEO Eng. Kamal Zoubi pointed out that the company was not only able to complete all projects within the allotted timeframe, but it also was able to expand the scope of the program by utilizing financial savings of around $23 million. According to Zoubi the savings were used to purchase state-of-the-art wastewater cleaning vehicles to facilitate the proactive maintenance of Zarqa Governorate’s wastewater network, as well as the construction of a new building for the Zarqa Water Authority to improve operations and services. Moreover, the savings were used to extend the wastewater network to over 300 km - instead of the initial 169 km - thus expanding the network to new areas like Princess Haya neighborhood. The savings were also used to extend the water network to include Jabal Al-Amir Faisal in Russeifa. Throughout the program, MCA-Jordan gradually handed over complete details and required knowledge of the projects to the Ministry of Water and Irrigation/Water Authority.